Filet Mignon : Tender, tender, tender. Expensive. 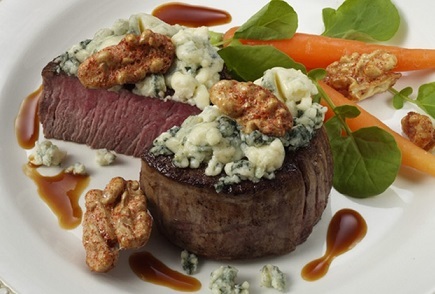 Use this restaurant Filet Mignon Recipe to enhance the occasional extravagance you deserve! We all need to treat ourselves occasionally. 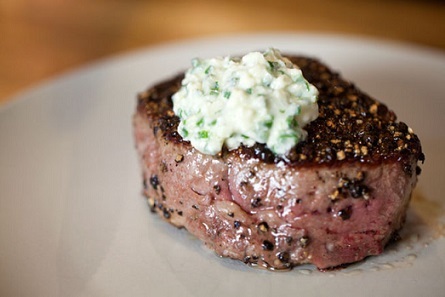 The restaurant guests love the Bleu Cheese Butter with their steak. It is what helps make this a favorite restaurant recipe. What is filet mignon or tenderloin? The words seem to be at odds with each other, but actually they are not when you think about it. A filet mignon should be fairly thick. And even though it is thick, the meat remains easy to cut (tender or dainty). Filet mignon comes from the small end of the tenderloin (called the short loin) which is found on the back rib cage of the animal. This area has no connective tissues that are hardened because the area bares no weight. The term tenderloin or chateaubriand refers to the entire strip of meat. Slices of tenderloin are called filet mignon. Some people say that a filet mignon is so tender it should never be cooked beyond medium-rare because the longer you cook it, the less tender and more dry it becomes. That is how I like my tenderloin cooked. That said, you should cook it to your own preference. Although experienced cooks can touch a piece of beef to gauge doneness, I recommend using a meat thermometer. Even the chefs at the restaurant use one to double check themselves, especially when cooking expensive product! A dry, high heat method such as broiling, roasting, pan-frying or grilling work well with this tender cut of beef. For this filet mignon recipe, I use a cast iron skillet to pan fry the steak. Using a heavy sauté pan or even better, a cast iron skillet, will form that brown, flavorful, crusty surface that everyone seems to love. Yummy! A tenderloin has no surrounding fat tissue so that is why you see that it is often wrapped in a layer of fat (called barding) such as bacon. This helps to keep it from drying out and it also adds flavor. One other note worth mentioning: this recipe is fine for a low carb diet. Just don't serve it with potatoes or white rice. At the restaurant we are all familiar with the request "double vegetables - no potatoes." Preparation time: 10 minutes for the Bleu Cheese Butter. 10-15 minutes for the clarified butter. Cooking time for the steak depends on desired doneness and thickness of the cut (1 inch should be the absolute minimum). Serves 4. Important: If the steaks are fairly thick and you are cooking them to medium or above, turn the heat down to medium or medium-low when you turn your steaks over so the meat will not brown too much. 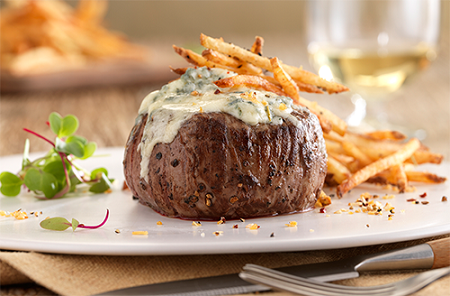 Enjoy your Filet Mignon Recipe with Bleu Cheese Butter and the company of those you share it with! Did you know? O. Henry (pen name of William Sydney Porter) was the first to use the term "filet mignon" in his book 'The Four Million' in 1906. (Egads! My husband's sense of humor!